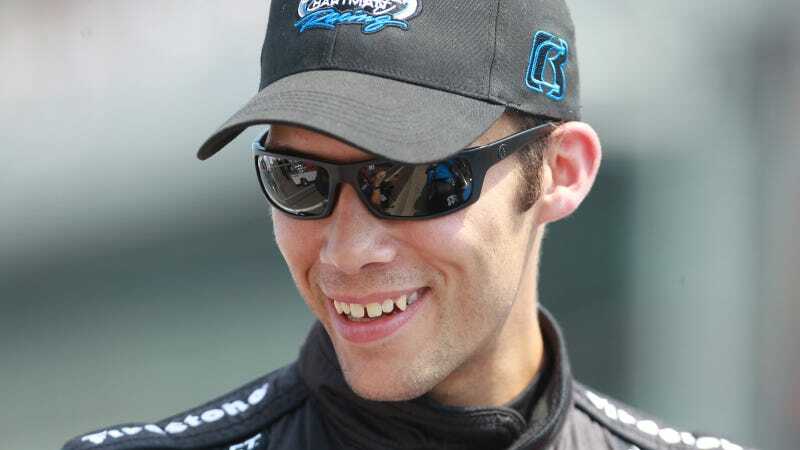 Racing driver and dirt-track specialist Bryan Clauson was airlifted out of the Belleville Midget Nationals race tonight after his car hit the guard rail, flipped and was t-boned by another competitor, per Racer. Belleville’s feature race was red flagged as a result. Starting ninth, Clauson had just taken the lead from Chad Boat and was starting to pull away when he encountered lapped traffic on the lightning-quick half-mile dirt track. The 27-year-old resident of Noblesville got stuffed into the fence by a lapped car and went into a series of snap rolls before landing on his side, at which point he was struck in the cockpit by an oncoming car at a high rate of speed. Earlier this week at Belleville, Clauson was involved in a hard hit on the last lap of night 1 of the races there that left him sore but otherwise unharmed, per an update on the Bryan Clauson Racing Facebook page. Clauson has won three times at Belleville in the past. Clauson is a racer’s racer if there ever was one. He’s appeared in IndyCar, NASCAR and myriad dirt track races, and even made a recent appearance on Jalopnik to coach Raphael Orlove through Eldora. This year, Clauson committed to running 200 races, and tonight’s race at Belleville was number 117. Our thoughts are with Clauson for a quick recovery. Video of the crash has also surfaced, showing Clauson’s car rolling several times along the wall and going airborne when upon impact with another car. UPDATE [8/8]: Clauson died at the hospital Sunday night as a result of these injuries, per a family statement posted on social media.